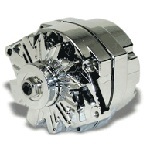 Highest quality chrome alternators. 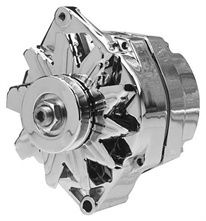 With many popular styles available in chrome, including Delco 10Si and 12Si alternators, Ford 3G series, and Delphi AD244 series. 35 Amp, 6 Volt Delco Remy type 10Si series positive ground alternator with self exciting (one-wire) internal voltage regulator. 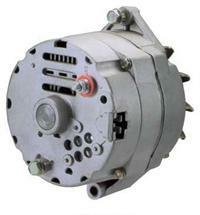 105 Amp Delco Remy type 12Si series alternator with self exciting, internal voltage regulator. 53 Amp, 6 Volt Delco Remy type 10Si series positive ground alternator with self exciting (one-wire) internal voltage regulator. 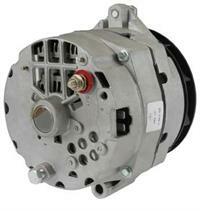 140 Amp Delco Remy type 12Si series alternator with self exciting, internal voltage regulator. 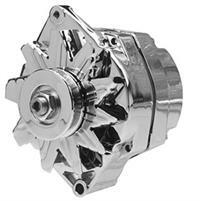 170 Amp Delco Remy type 12Si series alternator with self exciting, internal voltage regulator.